5 Bedroom Semi Detached House To Rent in Sutton for £3,750 per Calendar Month. 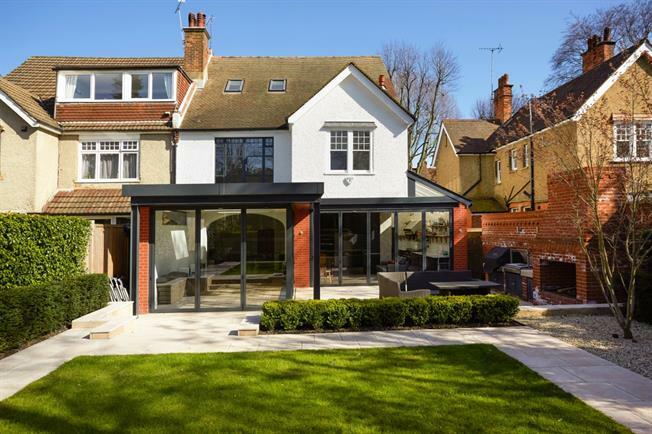 This stunning newly refurbished home is ideal for modern family living and is positioned on a residential tree-lined road, within 0.5 miles of Sutton station and town centre. The accommodation is set over three floors, offering a master bedroom suite with walk-in wardrobe and Juliette balcony on the first floor with a further two double bedrooms and family bathroom. To the second floor you have two double bedrooms, serviced with a wet room. The downstairs offers flexible living accommodation, with it's large open-plan kitchen/diner with high specification appliances, rotisserie, basement/wine cellar and doors opening onto the landscaped rear garden, separate utility room leading to WC, study/playroom and large sitting room with feature fireplace and direct garden access. Externally there is a landscaped rear garden with patio area, built in barbeque, rotisserie and chimney for entertaining. To the front there is driveway off street parking and converted garage for storage. Externally there is a landscaped rear garden with patio area, built in barbeque, rotisserie and chimney for entertaining. To the front there is driveway off street parking and converted garage for storage.